A separate deposit of $100 US is required. Guest are also required to purchase and load their own prepaid minutes. Please request cellphone reservation prior to check-in? We love the Point and go there every year. This was our first time at this unit and to be honest, we were a bit disappointed. It was very poorly stocked and when we asked for additional towels, they were not provided. We spent a few days tracking down someone for housekeeping. If you plan on cooking, it’s a VERY small space with zero counter tops and limited supplies. We made do, although it was awkward. There was a separate little kitchen cart to put a few things on thankfully. The room was clean and comfortable, but extremely basic (no decor or personal touches). No shelves for bathroom toiletries etc so we had to keep them in another room. 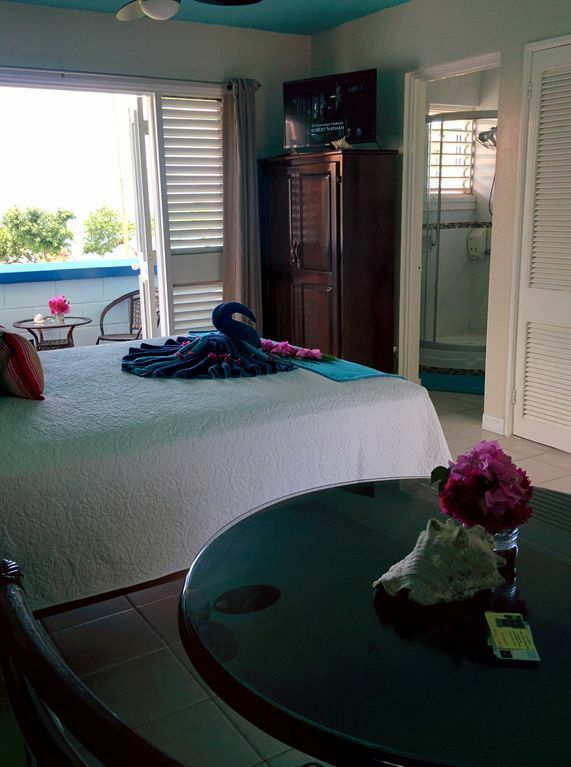 There was nowhere to hang wet swimsuits and towels to dry (which is a must in Jamaica!). The view was fantastic and was the only reason we chose to stay here. It mostly made up for what the room was lacking. We had a very relaxing time. The grounds are safe and quiet. The condo was very clean. The shower was great. We won't hesitate to come back here again. Nice space , ocean view, quiet, clean & relaxing. Really enjoyed our time here. Thank you sooooo much Imani, and the girl who clean the room and the taxi driver!! I am sooooooooo happy that we got to stay this property with such great crews ! I am impressed by all of your kind dedicated support and hospitality ! My stay was great. Upon arrival I was greeted by property Manager, Crystal. She help me with my luggage and brought me to the room. The room and property was as described in the listing, very clean and well maintained. All the appliances,AC and Safe was in good working condition.The price was excellent and the location and views from the room were spectacular. The owner,Imani, was very kind and attentive to my request and I want to thank her for everything. The place was great small but cozy and clean, the kitchen and the room in general had everything you would need from an ironing board to a bottle opener I even saw a wine bottle opener which to say the least is rare.There's a small beach on the property thats never crowded and perfect for someone like me that's likes to layout in peace and quiet without all the loud entertainment that goes with the big resorts.Overall I give this place a 10 out of 10.